Imogen Bertin: Confused of Cork: What is a MOOC? I'm trying out a MOOC (Massive Open Online Course) for the first time. Wha? 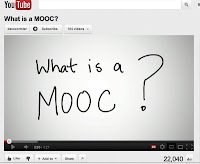 Here's a nice explanation of what a MOOC is by Dave Cormier. It's a course based on constructivist, and even connectivist ideas, usually free with no entry requirements. The participants create the learning between themselves with guidance from the organisers. It isn't just in one place online like a Blackboard or Moodle course. The one I'm taking is on twitter, the social bookmarking tool Diigo, people's blogs and anywhere else they fancy. The course is about learning analytics. 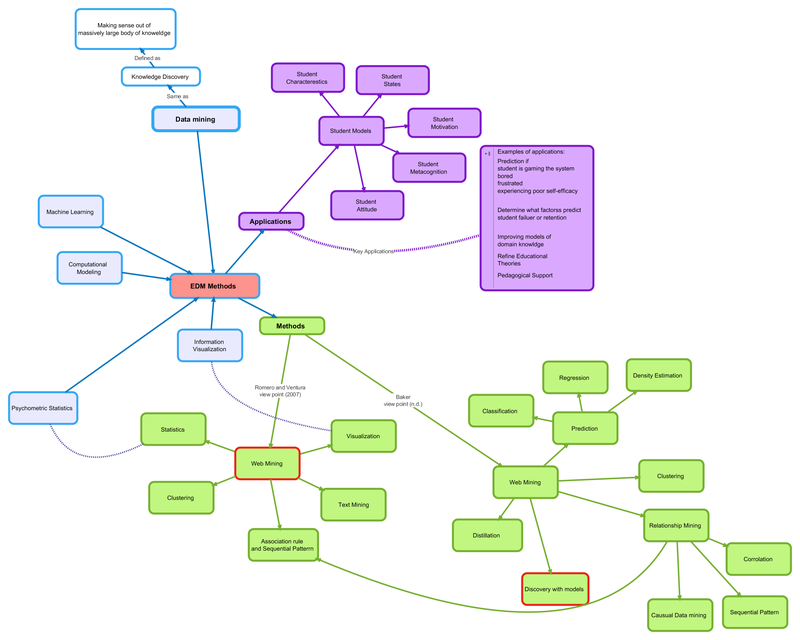 Don't ask me to explain it all yet... but it's about using all the ways we have to collect and analyse data, much of it developed for website analytics or enterprise resource planning, to figure out how to do education better. 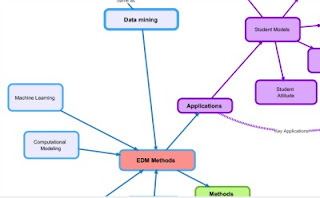 Here's part of a concept map about educational data mining that one of the other course participants contributed on a webinar hosted in Canada last night. There were over 80 people taking part in the session, using a shared whiteboard and a backchannel for text comments. I'm a bit worried that everyone else knows much more about data mining and data warehousing than I do, but reassured that they plan to cover the ethical issues. And to look at how limited just using digital data is. And to think about how you could use mobile technology to connect real world and digital data. It's nicely informal and messy, and there's already problems with different tags being used on Diigo and twitter #LAK12 and #LAK2012. My first question: what on earth is "transaction-level data"? Does that just mean getting out the credit card? If you'd like to join the MOOC go to http://lak12.mooc.ca/index.html where George Siemens seems to be doing a fine job. I read your post with much interest. I still have some work to do on my listening skills in English, thus participating to the webinar isn't very effective for me. Serena, I just wondered how you got on with the MOOC? Due to pressure of work I didn't manage to finish it but I hope to join in again next time it runs.